i adore nyx polishes, i don't have enough of them! the bottle shape is divine and the colors are really unique. asphalt is the perfect name for this guy, a black (almost greyish) jelly-like base color with mult-colored & sized glitter pieces. it really does look like asphalt haha, but way better because of the bling! 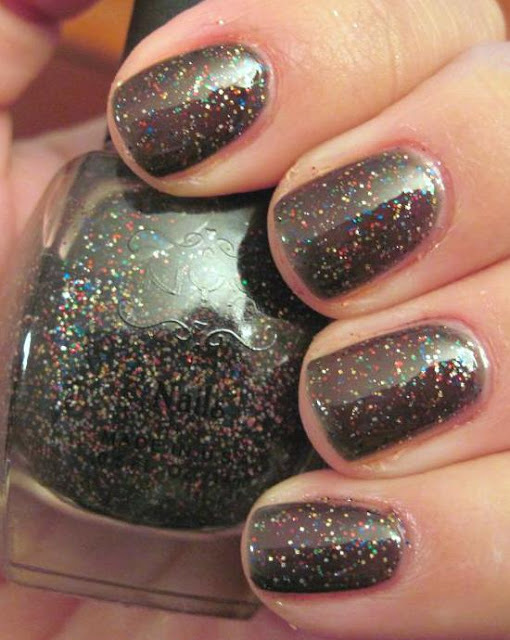 but not too glitzy, a toned-down gal would feel comfortable rockin' this polish right along with us glitter-bombs. understated but totally hawt. this is 3 coats, no topcoat. p.s. these pics were taken with a crappy camera that i have since returned, but i took a LOT of swatch pictures with. please bare with me as i will try to edit their horribleness to the best of my ability. the second pic has more lamplight shining on it and you can see more of the jelly-like quality to the base. i la la love this polish! it really reminds me of sephora by opi's 212 but not brown based and smaller (?) glitter pieces. i think i like this one better tho, it's cheaper!